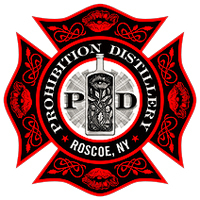 Spirits Prohibition Distillery is located two hours northwest of New York City in historic Roscoe, NY. Most people know our Catskill town as the home of American fly fishing, but we like to think of it as a "Distilling town with a fishing problem". We made the 1929 Roscoe Firehouse and former VFW Hall our home. Our goal is to produce the highest quality spirits, help our local economy, and live our dream along the way. Bootlegger 21 Vodka - Bootlegger 21 New York Vodka is made from 100% Corn, which is slowly filtered through a proprietary filtration process using charcoal for over 24 hours to give our silky smooth mouth feel. What most people don’t know is the best way to “taste” a vodka is by touching it. Most vodkas feel oily, but as they dry become sticky due to additives like glycerol and sugar. Bootlegger 21 Gin- We steep our botanicals in 120 proof neutral spirit made from 100% Corn for 24 hours to produce our maceration. We then distill the gin in our 300 gallon pot still to remove all of the color and bind the flavors. Bootlegger 21 Bourbon - New York Bourbon, It’s made from 100% New York corn mash. We pot distill our Bourbon then age it in new charred toasted oak barrels until we feel they’re ready.ur barrel sizes vary by batch between 5 and 30 gallons. When ready, our barrels are poured through cotton mesh to capture any particles of charcoal from the barrel. It’s then blended with water and bottled at 92 proof (46% abv). When you taste our Bourbon, flavors of cinnamon, vanilla and dark chocolate will pleasantly linger on the palate.